There is no right or wrong to your perception of work life balance. What is right for you, may not be right for others but it should be how you would like it to be. What is right for you now, may not have been ten years ago, or indeed may not be five years hence but it is how you would like it to be right now. Most of us have gone into self employment because we have been good at what we do and/or really wanted to get out of the rat race and be our own boss. 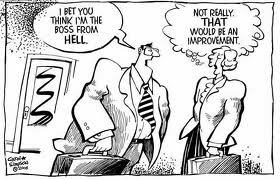 However, now we find we are working for the boss from hell … 24/7!! So much for the work/life balance aim! Trouble is that we get caught in the trap of not being able to say NO as we don’t know when the next piece of work is going to hit down and before we know it we are working all the hours with no time to stop and think about what it is we are doing. It may be that the balance is actually right for each of us right now but have we actually thought about that? These four questions (or the answers to them) become a powerful foundation to the Design of your Life. But it would be difficult to apply the questions generally and get any specific response. So break down your life into eight important areas like, your health, your wealth, your partner, your friends, your personal development, your spirituality, your home, your community, fun, leisure, holidays, love etc. Rate each on a scale of one to ten as to your current satisfaction level. You then get a feel for areas that may require some attention. In which case the questions above will start to take on some significance. As you start to make some changes in one area of your life you may find improvements occur in other areas. The first is: is ten enough? The second relates to the parable of the Mexican Fisherman who has, by his own admission, his perfect life. Why should he spend 15-20 years building a business that will earn him enough money to live the life, in retirement, that he currently has today? Rethink … how close are you to 10 already? Apart from … working for the boss from hell … of course!